KV601SP – Wheeled Vacuum offers powerful suction and easy operation make clean up of debris during the autumn clear up season much easier. 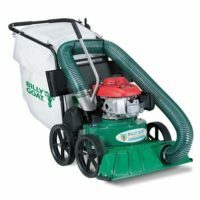 The 27” wide lawn and litter vacuum is ideal for residential and property maintenance. An optional hose kit helps reach between shrubs, beds and under decks. This model is a self propelled version with a well respected Briggs & Stratton engine. Designed for Rugged Use Collect pinecones, leaves, grass clippings, bottles, cans all while walking at a comfortable pace. All New Bag Design Zipper less bag features for easy unloading. Height Adjustment, 4 easy adjustments from the handle. Integral Dust Skirt Keeps Dust Away From Operator’s Face.